The S.T.J. 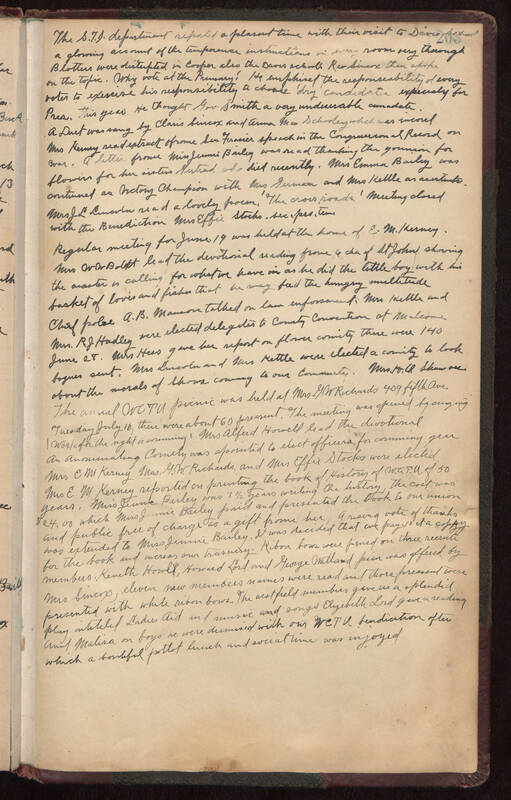 department reported a plasent time with their visit to Davis (illegible) a glowing account of the temperance instructions in every room very thorough Blotters were distripted in Cooper also the Davis school's Rev Sincox then spoke on the topic. Why vote at the Primary! He emphised the responseability of every voter to exercise his responsibility to choose "dry" candidate expecialy for Pres. this year. He thought Gov Smith a very undesirable candidate. A Duet was sang by Claris Sincox and Anma Mae Schooley which was incored. Mrs Kerney read extract from Miss Jennie Bailey was read thanking the (Illegible) for flowers for her sister Gertrud who died recently. Mrs Emma Bailey was continued as Victory Champion with Mrs Germon and Mrs Kettle as assistants. Mrs L. J. Lincoln read a lovely poem "The cross roads" meeting closed with the Benediction Mrs Effie Stocks sec. pro. tem. Regular meeting for June 19 was held at the home of E. M. Kerney. Mrs W W Boldt lead the devotional reading from 6 ch of St John showing the master is calling for what we have in as he did the little boy with his basket of loves and fishes that he may feed the hungry multitude Chief police A.B. Manson talked on law inforsement. Mrs Keller and Mrs. R.J. Hadley were elected delegates to Comty Convention at Malcome June 28. Mrs Hess gave her report on flower comity there were 140 boques sent. Mrs Lincoln and Mrs Kettle were elected a comity to look about the morals of those coing to our community. Mrs H.Q. Shaw sec. The annal WCTU picnic was held at Mrs G W Richards 409 fifty Ave Tuesday July 10, there were about 60 present. The meeting was opened by singing "Work for the night is coming". Mrs Alferd Howell lead the devotional an annunating comity was appointed to elect officers for coming year Mrs E M Kerney Mrs. G. W. Richards, and Mrs Effie Stocks were elected Mrs E M Kerney reported on printing the book of History of W.C.T.U. of 50 years. Miss Jennie Bailey was 3 1/2 years writing the history, the cost was $24.00 which Miss Jennie Bailey paid and presented the book to our union and public free of charge as a gift from her, A rising vote of thanks was extended to Miss Jennie Bailey. It was decided that we pay 40 ct a coppy for the book and increase our trasuery. Ribon bows were pined on three recruite members, Keneth Howel, Howard Lord and George Watland pian was offered by Mrs Sincox, eleven new members names were read and those present were presented with white ribbon bows. The westfield members gave us a splendid play intiteled Ladies Aid and music and songs Elizebeth Lord gave a reading Aunt Malisa on boys we were dismissed with our WCTU benediction after which a bountiful potlot lunch and social time was injoyed.